book | It's a Mad House, a Mad House!! I’ve found lately that I’m enjoying fewer and fewer novels. I’m having to hunt more for books that I find compelling and challenging and gripping enough for me to tear through them. All too often I find myself slowly wading through novels lately and being happy to have finished them. It’s not that they’re bad, they’re just uninspiring. Shannon (my wife) and I have such different reading styles and preferences that, despite her voracious appetite for books it’s rare that we can recommend and/or discuss books together. Since I’ve discovered Roth, I’ve tried to ensure that his books enter my rotation so I bought a copy of Indigation the last time I was at the bookstore. I was very impressed with this bookand really enjoyed it. I tore through it at a pace that I rarely read at any more. It’s a story of fear and breaking away. Marcus finds that when he enters college his father’s fear for his well being is so irrational and so disruptive that he must leave New Jersey and go to rural Ohio. With the Korean War hanging over his head, Marcus struggles with roommates, falls in love, struggles with authority figures and makes choices that ultimately guide him along his path in life. I don’t want to give anything away but this book and Roth’s writing were powerful. The thing that amazes me about Roth is that his writing is so straightforward, so simple, yet so eloquent and powerful at the same time. He seems to so easily generate fear, dispair, love, desire, power through his writing. He’s one of the few authors I’ve found lately that makes me feel deeply and strongly while reading. 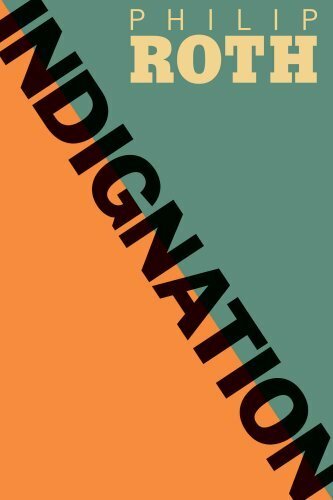 Indigation is definitely worth reading. It’s by no means a happy story, but it’s a great, thought provoking book.